URBANA, Illinois, July 26, 2012 (ENS) – A 10-year prison sentence was imposed today on an Illinois man who was convicted of illegally removing asbestos insulation and exposing workers to dangerous asbestos-laden dust. Duane “Butch” O’Malley, 59, of Bourbonnais, Illinois was convicted by a federal jury on September 26, 2011, for the illegal removal, handling and disposal of asbestos from a Kankakee building in August 2009. Today Federal District Court Judge Michael McCuskey sentenced him to 10 years in prison. The judge also ordered O’Malley to pay restitution of $47,086 to the U.S. Environmental Protection Agency for cleanup of the illegally disposed asbestos and to pay a fine of $15,000. Asbestos, a hazardous air pollutant, is a mineral fiber used in building construction materials. 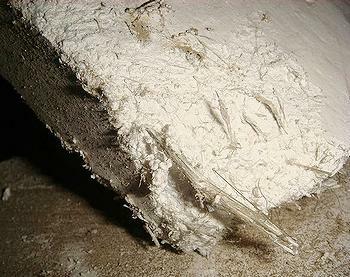 When asbestos-containing materials are damaged or disturbed by repair, remodeling or demolition activities, microscopic fibers become airborne and can be inhaled into the lungs, where they can cause serious health problems, including lung cancer and mesothelioma. “To increase his profits, a jury found that O’Malley knowingly disregarded federal environmental laws that require asbestos-containing materials be safely removed and properly disposed,” said U.S. Attorney Jim Lewis, Central District of Illinois. “This sentence is a consequence of the defendant’s flagrant disregard for his workers, the public, and the environment in exposing them to dangerous airborne asbestos fibers,” Lewis said. During O’Malley’s trial, the government presented evidence that O’Malley, owner and operator of Origin Fire Protection, was hired by Michael Pinski in August 2009 to remove asbestos-containing insulation from pipes in a five-story building in Kankakee that was owned by Pinski through his company, Dearborn Management, Inc. Evidence was presented that neither O’Malley nor his company was trained to perform the asbestos removal work and that O’Malley agreed to remove the asbestos insulation for an amount that was much less than a trained asbestos abatement contractor would have charged to perform the same work. Further, O’Malley arranged for James Mikrut to recruit and oversee workers to remove the asbestos. Instead, the asbestos insulation was stripped from the pipes while dry, and placed in more than 100 large, unlabeled plastic garbage bags. The bags were then dumped in an open field in Hopkins Park, a small town in Kankakee County, resulting in soil contamination and exposing the workers and nearby residents to asbestos-laden dust. Under the Clean Air Act there are requirements to control the removal, handling and disposal of asbestos. Pinski and Mikrut, who were also charged, have both pleaded guilty and will be sentenced later.